There is nothing like fresh and seasonal fruits for that natural way to cool your body as well as indulge your sweet tooth! Fruits are loaded with essential vitamins and antioxidants that are very important for skin that glows from within. They can even be incorporated into refreshing natural face packs for summer to deal with a lot of summer skin problems caused by pollution and excessive sun exposure. The effects of oily skin, acne, blemishes, dullness and tan can be reduced considerably by regular application of these completely natural face packs. Here are 7 refreshing fruit based natural face packs for summers. During summers, skin can get oily or sometimes even excessively dry if you live in areas prone to torturous hot winds. 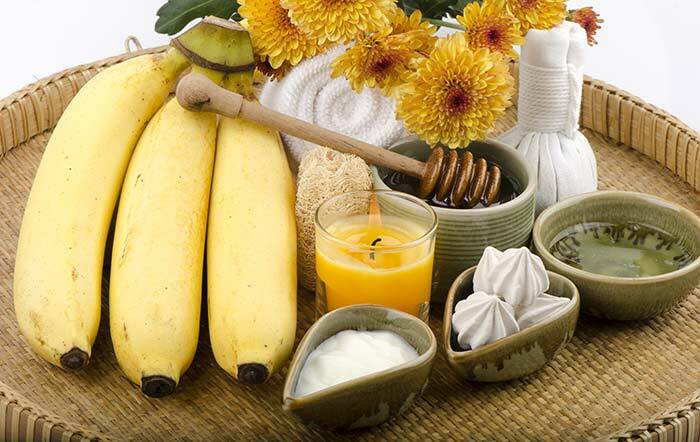 A banana face mask can reduce a lot of the combination skin issues that plague us during summers. Just mash half a banana (one that is over-ripe is ideal). Mix in a tablespoon each of honey and sour cream to this. Apply it on your face and wash off after 10 minutes with lukewarm water. Pat dry. Your skin would get a lot smoother and would regain its lost moisture, thereby appearing more supple. This pack is a one-fruit solution to all summer skin problems. From tan to dullness and overactive sebaceous glands, this pack will combat all issues. Puree half a bowl of papaya (you can keep the skin on if you would like to use this as a mild scrub) and mix in a tablespoon of honey and a teaspoon of lemon juice. Apply it to face leaving the area around your eyes. Leave it on for 15 minutes and rinse with cold water. 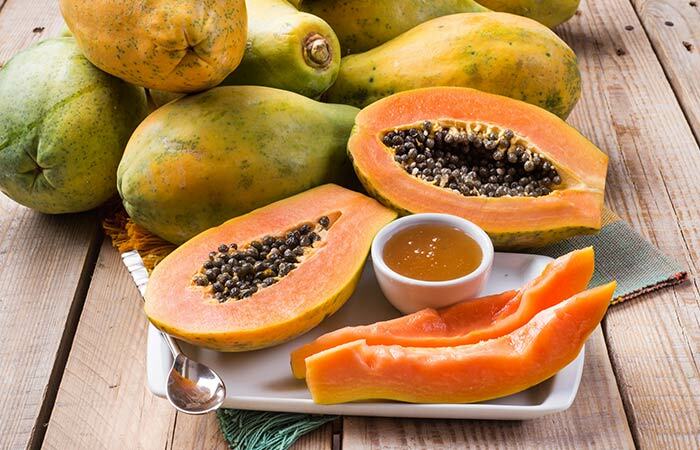 Papaya is very rich in antioxidants that help with the removal of old dead skin and stimulate the growth of new ones. Lemon exfoliates and tones the skin. Honey works wonders as a moisturizer. Watermelon is an amazing coolant that also conditions your skin, while yoghurt softens, moisturizes and also soothes irritated skin. Almonds will exfoliate the skin gently. Hang half a cup of curd in a muslin cloth for about 20 minutes. This will remove all the excess water and give you a semi-dry chunk of yoghurt. Grind 5-6 almonds (after soaking overnight and peeling them) into a paste. Puree watermelon and use 1/4th cup of the juice (unstrained). Mix all the three ingredients thoroughly to make a uniform paste. If it is too watery, you can add a little gram flour to achieve a paste-like consistency. Apply this paste evenly on your face and neck and leave it on for around 15-20 minutes. Before washing it off rub it gently on your skin in circular motion for a minute or two and then rinse with cold water. 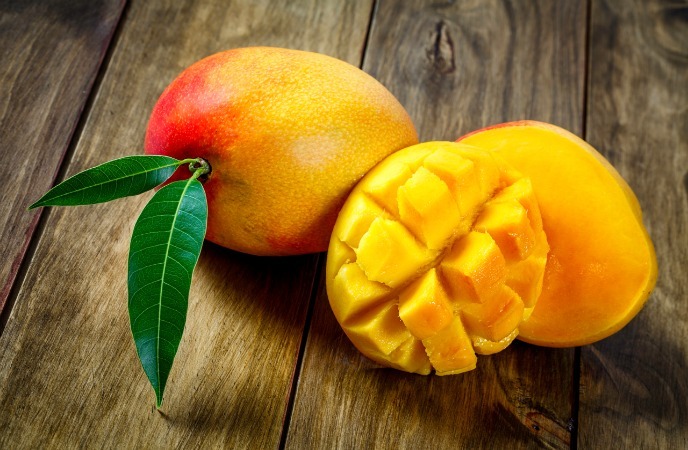 Mango is a very skin-friendly summer fruit. This pulp of the king of fruits is loaded with powerful antioxidants and vitamin C that help promotes a healthy, fairer and luminous skin naturally. Peel half a mango and cut into small chunks. Mix in a tablespoon of organic brown sugar and 2 teaspoons of argan or olive oil. Use a spoon to mix, do not blend or else it will turn too watery. Apply the paste evenly all over your face and neck. Leave it on for 15 minutes. Rinse off with cold water. While mango enhances the skin’s natural glow by removing tan, sugar works as an exfoliant and Argan oil moisturizes the skin. This face pack help tightens skin pores, stimulates skin renewal and also naturally lightens the skin. Take 2 tablespoons of fresh grape juice (just peel and crush a handful of grapes) and mix in a tablespoon each of lemon juice, wheat flour and aloe vera juice (if your skin is also tanned). Apply the paste and let it dry completely. After it has dried, splash some cold water and if needed, remove the pack with a wet washcloth in an upward direction. Rub an ice cube wrapped in a clean washcloth over the skin to seal in the goodness. Apple is a miraculous fruit for your skin. This crunchy, delicious fruit is packed with skin lightening vitamins that leave skin naturally fairer and glowing. 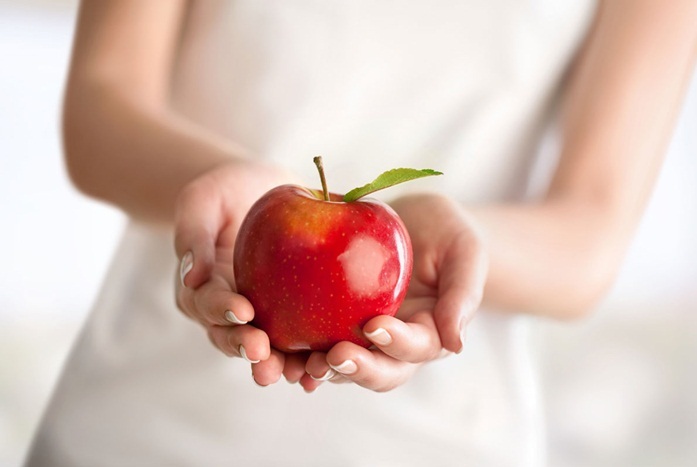 The polyphenols in apples are natural antioxidants that have anti-ageing and skin smoothening properties. This pack also prevents acne and pimples and gives a baby soft, smooth and fairer skin. Take some peeled apple slices in a blender, add 1/4 cup green tea, a tablespoon of milk cream and two tablespoons of rice powder. Blend well and keep in the freezer for 5 minutes. Apply this cold pack on cleansed face and neck and wash off after 20 minutes. Your skin looks soft, fairer and gorgeous like never before. This tropical fruit is one of the best natural ways to get flawless fair skin. Pineapples are rich in vitamin C, B-6, phenolic acids and most importantly, an exfoliating enzyme known as bromelain that gives a natural fairness and youthful glow to the skin. This face pack naturally lightens facial hair, firms facial skin and gives a fairer and even skin tone. 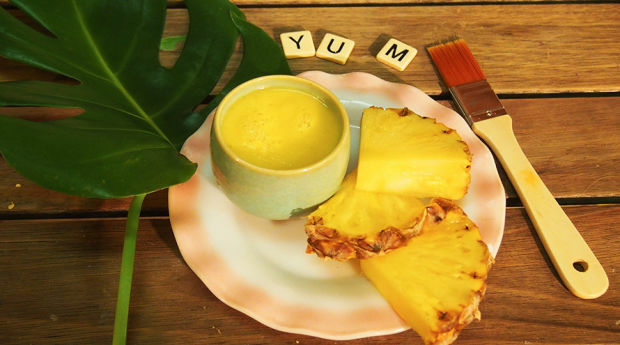 Take two tablespoons fresh pineapple paste (please use only fresh paste within five minutes of pureeing the fruit, or else the enzyme gets oxidised) and mix in 2 teaspoons lemon juice and a tablespoon of honey. Clean your face well before applying a thick coat of the pack. Wash off after 15 minutes and admire the youthful glow. If you have dry and sensitive skin, replace the lemon juice with an equal amount of aloe vera gel.